The first cover I did for "Iron Man" magazine was in 1988 as the hero, Hercules incarnate. My last cover shoot was the April 1992 edition—or so I thought. I never dreamed I would be featured on a cover 20 years later. I think I felt like a 20-year-old kid again when I got the October 2011 issue in the mail with me—now 48 years old—on the cover. And I looked pretty good, I have to admit. How in the world did this come about? I was inducted into the Muscle Beach Hall of Fame Memorial Day weekend, 2011. While I was there, I ran into John Balik, the owner of "Iron Man." We caught up a little and then he asked me if I would ever consider appearing on a cover again. "I'd love to," I said quickly. "Good," he said, "we have an opening and the photo shoot is on July 15. Can you be ready?" My mind started doing the math as quick as I could. That would give me 52 days to prepare for a photo shoot. Could I do it? At age 48? "You bet I can," I answered. That's how I've always been. Accept the challenge and figure out how to get it done later. I hadn't competed in a bodybuilding competition for nearly two decades. 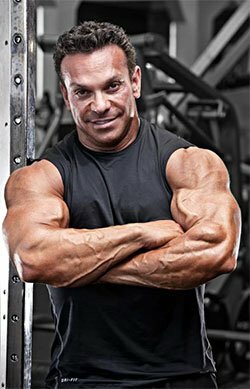 I was still highly involved in the sport through my nutritional supplement company, Gaspari Nutrition, attending competitions, and sponsoring professional athletes, but my body wasn't where I wanted it to be. "I wanted to get myself into the best shape of my life—not only for my age, but for any age." I wasn't in bad shape, but with my work being done from behind a desk and loads of corporate travel, I felt soft. But what was bugging me even more was that I felt a little hypocritical. Here I was, the CEO of a company that emphasizes fitness and maximizing one's physicality, and I wasn't practicing what I preached. If I was going to challenge my customers and fans to believe that mediocrity was not acceptable and to reach for their best, then I knew I needed to throw down the same challenge for myself. Now everyone knows a 48-year-old man can't compete, right? Some of my best friends let me know it. Of course that wasn't the first time I'd heard, "You can't do it." In truth, I didn't have any real plans to compete again, but I did feel a burning desire to work out like I was going to be in the Mr. Olympia contest. I wanted to get myself into the best shape of my life—not only for my age, but for any age. And one thing you should know about me: I am a competitive person. Failure wasn't an option. I mentioned up front that I was still in good shape. You have to be if you own a nutritional supplement company. People would tell me I looked good. But a lot of people would add, "Not like you used to look, but good." So I knew I had serious work to do to be ready. I was eating four meals per day—I had to ratchet that up to seven immediately. I was training four days per week—that increased to five. No way was I going to miss any training opportunity. "Don't forget the one person you are with 24 hours every day—the one you see in the mirror each morning." That's the mechanics of what I did. But what drove me? Was it to promote my company? Sure. But we were growing nicely already. Nothing as crazy as what I did was necessary! Was it to avoid embarrassing myself on a magazine cover with nothing but posing shorts on? I don't think so. But who knows? Pride can be a great motivator. I thought back to the last "Rocky" movie that came out in 2006, "Rocky Balboa." There's a scene where Rocky is asked why he's making a comeback and he says, "I still have the fire in my belly. I'm doing it for me." I like that. And that is my real reason. I did this program for me. There may be a lot of thoughts and motivations swirling around in your head. Maybe you're trying to get someone to notice you. Maybe you want to show your parents what you can accomplish. I've been there, too. But let me say to you right now: Do it for you, for your own personal sense of accomplishment. I'm a people-pleaser. You may be too. That's fine. There's nothing wrong with it. But don't forget the one person you are with 24 hours every day—the one you see in the mirror each morning. And here's a little secret you probably already know: When you please yourself, you are usually more pleasing to people around you. It's almost impossible to impress yourself and not impress others. If you want to take better care of the important people in your life, start by taking better care of yourself. Recommit yourself to your program. Hit the gym with a passion today. Don't do it for Rich Gaspari or anyone else. Do it for you. Impress yourself! Excerpted from "51 Days: No Excuses," by Rich Gaspari, coming March 14, 2014, from Dunham Books. Preorder your copy now!